At the end of every month, it's time to cash in my SBs - this month I made enough for three $25.00 Amazon gift cards - so it really does work! I've ordered and received the gift card codes in a couple of days, and included a picture below so you can see! Now I can take those $25.00 gift cards to Amazon, and stack them - so I have $75.00 off my next order. I haven't decided what I want to order yet, so I am going to hang onto these gift cards until I am ready to shop for free! So how did I do it, you ask? Well, first I signed up of course! Then I made the SwagBucks search page my home page, and used it every time I needed to search for something. Rather than go to a web page I regularly checked, I would put the URL in the SwagBucks search bar and search for it first. And sometimes I just put in search words for the fun of it! And I have won lots of SBs that way! Next I downloaded and installed the SwagBucks SwagButton - it works in Mozilla Firefox. Then every day the SwagButton automatically notifies me if the website I am visiting offers cash back for shopping, if it has any relevant coupons, and gives me Swag code alerts! From the SwagButton, I can earn SBs while searching the web or watching videos from all my favorite categories like Entertainment, Fitness, Food, News, and Sports. And get real-time alerts about new earning opportunities! Every day I look for the Swag Codes to be available and quickly searched for them - I think I found most of them - though I I sometimes miss the ones posted late at night. Anyone else get the late night ones? Every day I earn SBs for clicking thru the ToDo List, and you can do this every single day to earn SBs! Here's a picture of my three free Amazon cards order. Have you signed up yet?? 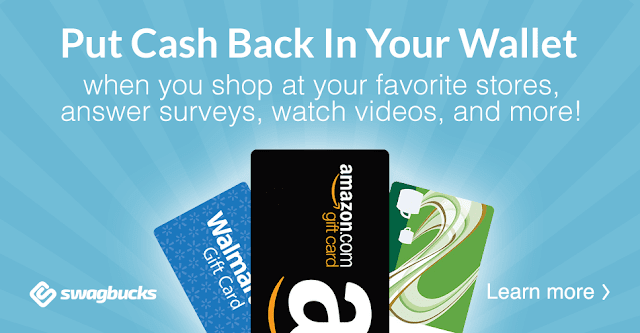 Swagbucks.com is an online portal dedicated to helping you earn digital dollars called SBs , which can be redeemed for exclusive merchandise, gift cards and other prizes. It is a search engine powered by Google and Ask.com. The important difference is whenever you search on the Swagbucks search engine, you have the chance to win SBs you can turn in for prizes and gift cards. You can easily earn enough points to get a $5 Amazon gift card or more every month - if you use it to do your usual searches! Swagbucks.com is the only place on the web where you can get FREE gift cards - simply by doing the things you do anyway, every day! 1. Search on Friday. It is good to do a search every day, but Friday is Mega Swagbucks Day! That means, your chances of winning the higher value Mega Bills are even higher. You could win up to 100 SBs in a single search! 2. Get a SwagButton, Stay Connected and Win More. The quickest way to win SBs is to have Swagbucks.com always at your finger tips. The Swagbucks.com SwagButton resides on the top of your browser, and only takes seconds to install. The Swagbucks toolbar is just like a Yahoo or Google toolbar, and makes it more convenient to seach, eliminating your need to visit the Swagbucks website. You will also occasionally get SwagCodes via the toolbar! Check the little message icon on the toolbar every day because Swag Codes are only good for a few hours. 3. Tell your Friends. If you are loving Swagbucks, then you are probably telling your friends already, so why not get some Free SBs for it? The quickest way to win SBs is to get a little help from your friends! Invite your friends to Swagbucks.com and every SB they win searching the web, you'll win as well! Go to the Swagbucks home page and click Promote at the top. You will be able to email your friends, post a banner or widget on your website or blog, or connect with your Facebook account. When your friend signs up using your unique referral link, you earn SBs every time your friend wins SBs. Double bonus! 4. Modify your Search. If I do a search and don't win a Swagbuck, I will often change my search term slightly to see if I can win. Example: I search for freebies and win nothing, so I add the word Canadian to make it Canadian freebies or Freebies Canadian (either way) and search again. For some reason, I usually win some SBs by doing this! 5. Search for Images or Video. This works about the same as modifying your search (above). After you search Canadian freebies or US freebies and don't win, click on Images or Video at the top of the page to see if you can win some SBs that way. 6. Search Daily. This might seem obvious, yet it is the one some people always forget! Searching daily builds SBs faster than any other method. Those 10-20 SBs per day add up quickly! If you can't think of anything to search for, search for something you already know. For example, instead of typing Frugal-Freebies.com in your address bar to come to my site, you could type it in on Swagbucks. You will still get to my site, just with a small detour and a chance to win a few SBs! 7. Want SBs quickly? Complete A Special Offer! Got your eye on something special in the Swag Store? If you're saving up SBs but could use a little help, check out their Discover Page. You'll find rewarding promotions from major brands. Sign up only for the offers that sound right for you! 8. Do you shop online? Visit the Shop and Earn mall before you buy. Odds are they have the brands you're already looking for, and they will give you SBs for every dollar you spend when you make your purchase through SwagBucks.com! You will also find 100s of coupons listed there. 9. Earn SBs and Reduce Your Carbon Footprint. Got a new phone in the last few years? Then send in your old cell phone and they will reward you in SB. Replace your old dust-collecting cellular with an exclusive swagbucks.com prize! There's no limit to how many phones you can recycle! 10. Interact With The Polls. Their daily polls page features topics and questions that matter to you! From popular culture; news, and entertainment, the Polls page is consistently fresh, and always fun. Plus, if you submit a poll and they happen to use it, they will award you with up to 10 SBs! 11. Receive The Newsletter - Get all the most important updates delivered directly to your inbox with the monthly newsletter. Every email is packed with important news and tidbits to help you get more out of your SwagBucks account. 12. Read the Blog - When big news breaks about SwagBucks, it happens first on the SBs Blog! Find out about all the newest offers, prizes, and Swag Codes, all in one convenient location. Look for posts by The Swag Guy for exclusive SB opportunities! So have you signed up yet?? NOTE - When searching the web, the best way to win SBs (and the only method we endorse) is to use the engine for genuine search and discovery. Doing a ton of searches, or clicking on search results, will not increase your chances of winning in any way.